At around five inches shorter than the Briton, Takam represents a different challenge to Klitschko but Joshua said he will change nothing about his fighting style. Anthony Joshua has no intention of taking a defensive approach when he defends his IBF, WBA and IBO world heavyweight titles against Carlos Takam in Cardiff, Wales, on Saturday. Home favorite Joshua delivered one of the finest nights in British boxing when he beat Ukrainian Wladimir Klitschko to be crowned heavyweight champion at Wembley, London, in April. "We're going to have a war, we're going to wear our hearts on our sleeves," Joshua told Sky Sports. "When people come to see me box, they know they are going to see knockouts and a bit of blood, and a bit of respect after. That's what boxing is about. "I'm a wholesome fighter, I've got that roughness in me. When I need to dig deep and the skills aren't working, I know I can pull it out of the bag." 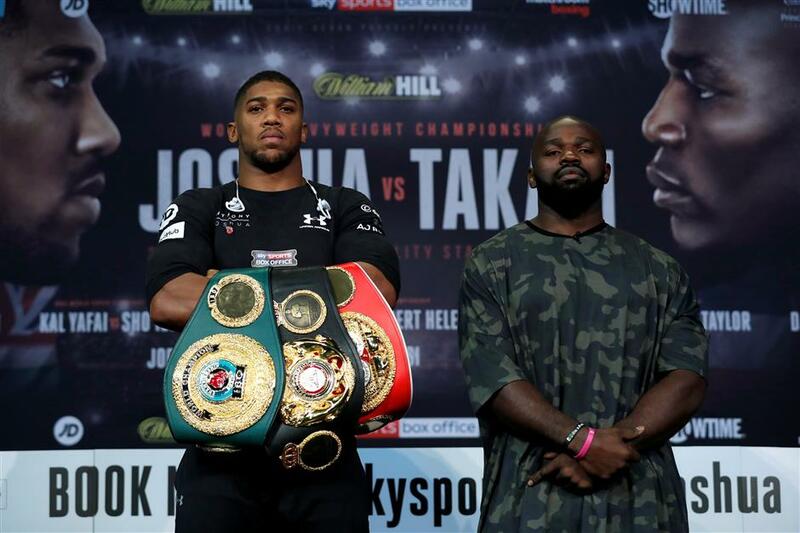 Meanwhile, 36-year-old Takam was relaxed about the prospect of fighting in front of 80,000 people at the Principality Stadium in Cardiff and said his speed gave him an edge over Joshua, who is unbeaten in 19 professional bouts. "I'm not bothered about fighting in front of 80,000 people, the only people in the ring will be myself and Joshua, nothing else matters except the two athletes," the Cameroonian-Frenchman, a late replacement for injured Bulgarian Kubrat Pulev, told British media. "If I can do things differently from what other boxers have done against Joshua, I'll have a chance to win by knockout. It will be just as important to work Joshua's body as well as the head, and my speed will be important too." Briton Anthony Joshua and Carlos Takam of France pose during a press conference at the Reardon Smith Theatre, National Museum Cardiff, in Cardiff, Wales, on October 26, 2017, ahead of their heavyweight fight on October 28, 2017.